Dave Brat promised that he would take his background in economics and ethics to Washington, D.C. and get to work on the big issues that matter most to you and your family. He has kept that promise. Now, at the start of his second term in Congress, Dave has put in bills to make D.C. more accountable, balance the budget, protect small business, and expand healthcare options for workers and families. He has voted to repeal Obamacare in its entirety, defund the President’s illegal executive amnesty, and reduce the tax and regulatory burden so that our economy can grow again. As the only Ph.D. economist in Congress, Dave Brat is uniquely qualified to tackle the current budget crisis we face in America. Serving on the House Budget Committee, and as a member of the House Freedom Caucus, Dave has been leading the charge in Congress for a more fiscally responsible budget process. When Congress is not in session, you are likely to find Congressman Brat on the road to a community event in the district or at a town hall, giving one of his famous Washington Updates. He often speaks in public defending the Judeo-Christian tradition, the Constitutional rule of law and free markets as the best way to lift all people up from poverty. Our founders were wise enough to choose the free market system and the result is what is arguably the greatest nation that has ever existed. Dave Brat threw his hat in the political ring after seeing the corruption and back door deals that plague our system. Almost everyone said it was impossible to unseat a sitting House Majority Leader. It had never been done before. But, Dave put his faith, as well as his trust, in the American people—and the voters responded by putting their faith and trust in Dave. Dave’s stunning election victory not only shook Washington to its core, it stopped the “Gang of Eight” immigration bill that was only days from passing the House, and put a halt to amnesty legislation in general. With help from the voters in the 7th Congressional District, Dave proved that character matters and that standing firmly rooted in your principles does pay off, even when you’re the underdog. Growing up in the rural Midwest, Dave learned the value of faith, family, and a strong work ethic at a young age. After graduating from Hope College in Michigan, Dave worked at the accounting firm Arthur Andersen and then the World Bank before attending Princeton Theological Seminary, where he obtained a Masters of Divinity degree. Following that, he earned his Ph.D. in economics from American University, while doing some work in graduate school as an economist for the U.S. Army. In 1996, Dave and his wife, Laura, moved to Henrico County, VA when Dave began teaching economics at Randolph-Macon College. Not long after, Dave became Chairman of the Economics and Business Department at the college. Before joining Congress, Dr. Brat served both Republican and Democratic governors on the Joint Advisory Board of Economists, providing critical economic forecasts to help manage the Commonwealth. His peers elected him as president of the Virginia Association of Economists. Dave also served on the Virginia Board of Accountancy, the Richmond Metropolitan Authority, The Great Aspirations Scholarship Program, and the investment board overseeing retirement assets for the Virginia Association of Counties. David Alan Brat (/ˈbræt/; born July 27, 1964) is an American economist and member of the United States House of Representatives, serving Virginia’s 7th congressional districtsince 2014. Prior to his election to Congress, Brat was a professor at Randolph–Macon College. Brat defeated House Majority Leader Eric Cantor in the district’s 2014 Republican primary on June 10, 2014. Brat’s primary victory over Cantor made him the first primary challenger to oust a sitting House Majority Leader since the position’s creation in 1899, and is considered one of the biggest upsets in congressional history. He defeated Democratic nominee Jack Trammell on November 4, 2014. Brat was born in Detroit, Michigan on July 27, 1964. Brat’s father, Paul, was a Doctor of Internal Medicine; his mother, Nancy, was employed as a social worker in Alma, Michigan, where he was raised. His family moved from Alma to Minnesota when David, the oldest of three boys, was in junior high. Brat graduated from Park Center Senior High School in Brooklyn Park, Minnesota. Brat attended Hope College in Michigan and received a B.A. in Business Administration in 1986; he also graduated with a Master’s Degree in Divinity from Princeton Theological Seminary in 1990 and earned a Ph.D. in economics from American University in 1995. After working for Arthur Andersen and as a consultant for the World Bank, Brat joined the faculty of Randolph–Macon College in 1996, where he served as chair of the department of economics, and taught courses including “Britain in the International Economy”, “International Economic Development”, and “Business Ethics”. From 2010 to 2012 Brat headed Randolph-Macon’s BB&T Moral Foundations of Capitalism program, one of sixty similar programs and chairs in the philosophy and economics departments at United States universities devoted to the study of capitalism and morality, endowed by the BB&T Corporation. In 2006 Brat was appointed by Virginia governor Tim Kaine to the Governor’s Advisory Board of Economists, a position he continues to hold. He has also served on the board of directors of the Richmond Metropolitan Authority, and on the advisory board of the Virginia Public Access Project. Brat ran against House Majority Leader Eric Cantor for the Republican nomination forVirginia’s 7th congressional district and defeated Cantor by a 12-point margin. Brat was outspent by Cantor 40 to 1: Cantor spent over $5 million, while Brat raised $200,000 and did not spend all of it. Brat’s primary campaign was managed by 23-year-old Zachary Werrell. An analysis of campaign filings conducted by the Center for Responsive Politic sconcluded that Brat did not receive any donations from political action committees, noting “it’s almost impossible to profile Brat’s typical donor, because he had so few.” Brat’s win was notable, as it was the first time a sitting House Majority Leader was defeated in his primary race since the position was created in 1899. Compared with Cantor, described as aloof, Brat was characterized as knowing how to work a crowd. He ran an anti-establishment campaign criticizing Cantor’s position on illegal immigration, government bailouts and budget deals while frequently invoking God and the Constitution in his speeches. During the campaign, Cantor criticized Brat as a “liberal professor” who had strong ties to Tim Kaine, Virginia’s former Democratic governor and current junior Senator. Brat’s victory was described in the press as exposing a “deep schism” in the Republican party between its conservative base and its business wing, as well as a split between establishment Republicans and Tea Party insurgents. Some libertarian oriented groups, such as the Virginia Liberty Party, backed Brat. Although the national media were shocked at Brat’s victory, Richmond-area media outlets had received signs well before the primary that Cantor was in trouble. The Richmond Times-Dispatch reported two weeks before the primary that a number of Cantor’s constituents felt he took them for granted. The Times-Dispatch also revealed that Cantor’s attempt to brand Brat as a liberal professor actually made more people turn out for Brat. The Chesterfield Observer, a local paper serving Chesterfield County—roughly half of which is in the 7th—reported that Tea Party-aligned candidates had won several victories there, and at least one Cantor loyalist believed Tea Party supporters smelled “blood in the water.” One local reporter told David Carr of The New York Times that many constituents believed Cantor was arrogant and unapproachable. However, due to massive cutbacks, the race was severely underpolled by local media. Few Capitol Hill reporters were willing to go to Cantor’s district, for fear that they would be out of Washington in case a major story broke. Brat faced Democratic nominee Jack Trammell, another professor at Randolph-Macon, and James Carr, the Libertarian candidate, in the November general election.Brat was favored because of the 7th’s significant Republican leaning (the district has a Cook Partisan Voting Index of R+10, showing it to be the most Republican district in eastern Virginia). According to an article in The Boston Globe, Cantor announced plans to aid Brat by resigning from the United States Congress on August 18, so that a special election could be held on the same day as the general election. Thus the winner, in a race in which Brat was favored, would take office with the perquisite of seniority over other first-term Republicans elected in the 2014 midterm elections and with the ability to participate in the lame-duck session of Congress. Brat defeated Trammell in that election, with 60.83% of the vote to Trammell’s 36.95%. Libertarian candidate James Carr finished third, with 2.09% of the vote. Incumbent Dave Brat defeated Democrat Eileen Bedell with 57.7% of the vote in the general election held November 8, 2016. 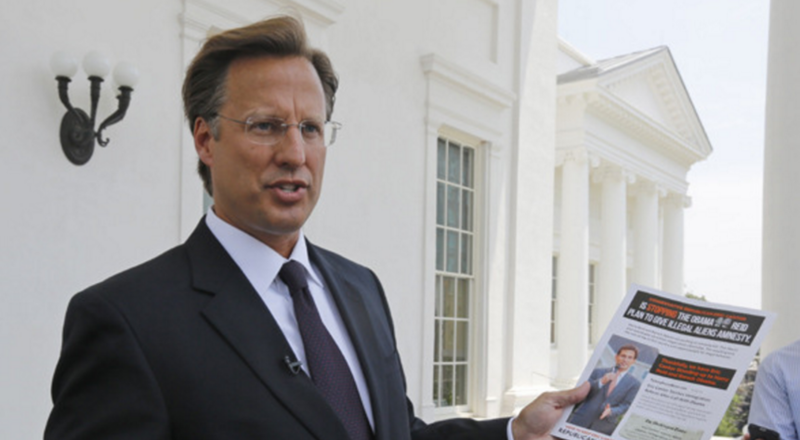 Dave Brat was sworn in on November 12, 2014 to finish Eric Cantor’s term. On January 6, 2015, Brat was one of twenty-five House Republicans to vote against John Boehner’s re-election as Speaker of the United States House of Representatives. Boehner, who needed at least 205 votes, was re-elected with 216 votes. Though Brat supported Boehner earlier, he reversed his support after the House GOP leadership did not allow him to make an amendment to block a controversial executive order signed by President Barack Obama in a spending bill. Brat faced heckling by 150 constituents at a “raucous” town hall meeting in the small town of Blackstone, Virginia, on February 21, 2017. Angry constituents questioned Brat on the border wall, health care, and President Trump’s policies. Several of Brat’s supporters left the meeting early. Brat was criticized for not meeting with his constituents because he claimed there were paid protesters among them. On January 28, at a meeting held at Hanover Tavern with “the GOP-friendly audience”, he had lamented that, “[s]ince Obamacare and these issues have come up, the women are in my grill no matter where I go. They come up — ‘When is your next town hall?’ And believe me, it’s not to give positive input.” He also urged his fellow conservatives at the Tavern, “to write newspaper articles because “we’re getting hammered.” Brat had considered running in the 2018 election. He is a member of the Freedom Caucus. In November 2017, the Richmond Times-Dispatch reported that a campaign staffer was using her personal Facebook profile to debate commenters on his Facebook posts. The woman did not identify herself as a paid campaign staffer. When asked about this, Brat said, “Her job is to clarify issues. And put out my policy positions from my vantage point. It’s not to argue with people.”Brat had another run in with social media on March 1, 2018, when it was discovered that his campaign Twitter account had “liked” several controversial tweets, including one that questioned whether one of the survivors of the Parkland school shooting, David Hogg was a “crisis actor”. After an outcry from concerned constituents, Brat’s office issued a statement that attributed the likes to a campaign staffer when they believed they were logged onto their personal account. He also stated that safeguards were being put in place to ensure it did not happen again. In a paper titled Is Growth Exogenous? Taking Bernanke Seriously, Brat criticized Federal Reserve chairman Ben Bernanke, asserting that Bernanke’s work on economic growth overlooks religious institutions – in particular Protestant – in a country’s economic growth, and that while savings rates, population growth, and human capital accumulation help drive economic growth, the larger factor is “the Protestant religious establishment”, which Bernanke ignores. Brat has blamed the rise of Adolf Hitler in Germany on the lack of “unified resistance”, adding, “I have the sinking feeling that it could all happen again, quite easily.” Brat believes that countries with Protestant pasts have economic advantages over countries that do not, and that Protestantism “provides an efficient set of property rights and encourages a modern set of economic incentives” that often lead to “positive economic performance”. He believes in Christ as a transformer of culture, and that capitalism is the key to world transformation, which can be achieved when capitalism and Christianity merge; if people follow the gospel, and as a consequence behave more morally, he argues, then the markets will improve. Zack Beauchamp from Vox Media has said that Brat believes that “most economists are motivated by philosophy rather than science: they’re secretly utilitarians who believe that the goal of public policy is to produce the greatest good for the greatest number.”Although Brat has stated he does not identify as a Randian, he has acknowledged having been influenced by Ayn Rand’s novel Atlas Shrugged and has expressed appreciation of Ayn Rand’s case for human freedom and capitalism.